As you know, I missed the excitement of CenturyLink Field and returned to work there recently. One of my ways of enhancing the guest experience is to offer to take a picture of the party as they arrive, or sometimes, once the game has started. In this case, the party included Dave and his daughter, son and daughter-in-law. From time to time, I would drop in and have a chat, and in the process, learn a little of their story. Dave has advanced bladder cancer (I had noticed the tube), had supported the Sounders for years, and wanted his kids to experience the enjoyment of the game for themselves. So of course, I offered to take their picture. Then I handed the camera to the daughter and said, “I can’t take a picture myself, but would you mind doing it for me, please?”. She didn’t mind at all. On a break at the same match, I couldn’t resist capturing a bike ride going past on the entrance to the Alaskan Way Viaduct. I have A ripe strawberry! Just one. There’s something about having a cat staring at you! Just for fun, and also to give myself a comparison, I mapped the populated areas of a variety of large cities. In terms of distance traveled sometimes for my job, I rate up there with some of them. As usual, you need to click on it to get the full effect. This just in from Paul. Kiana came third in the Best and Fairest at her Aussie Rules Football competition last year. The view from a recent job site. The occupants of these apartments will look straight out onto trees. Friday – Yet more surgery on my prostate area, to once again remove the re-growth. The surgery itself went well, but by the end of the day, I’d had enough of bursts of severe pain, that even the hydrocodone couldn’t touch, so I called the surgeon’s office and he called me back. He explained that it was most likely to be a bladder spasm, and that it would ease after a few hours. A few hours later, I figured it even though there wasn’t much in the catheter bag, it was time to empty it, which I did, to find that suddenly it was doing what it should have been doing all along – filling from the catheter! No wonder my poor bloody bladder was getting aggravated! Eventually, around bed time, I also figured out that having the bag lying on the floor wasn’t helping, as they are designed to hang from something, so I hung it from a knob an the bedside cabinet. Then I recalled having to do something similar in the bus all those years ago. Yes, I really did feel like that. Saturday – So pleased I have the whole weekend to get myself sorted out. The catheter attachment process has improved over time, with a sticky patch stuck to the leg, with a purpose built attachment with fits over the point where catheter tube branches. Great, but I want to support the exit point by wearing my undies to hold it in place, but if I do that, then the remaining tube is too short. Hmm, a bit of bush medicine is required here. Take the patch off, and of course it won’t stick like it did the first time. OK then, let’s tape it on there with Buddy Tape. Ah! Relative comfort. Then I needed to take a crap, and having forgotten to take lots of “stool softener”, it was pretty ugly. The consequent straining blew the hell off the surgery site, to the point where I was bleeding on the OUTSIDE of the catheter, and I decided to leave the catheter in until tomorrow. Sunday – With the relative comfort of the catheter being reasonably well secured, and not having to get up and pee during the night, I slept well. I decided to wait until Julie was awake before removing the catheter, which in itself is not a complex operation, I didn’t want to have something go wrong without her being able to help. As it turned out, when I did pull it out, she checked in on me briefly, before seeing blood spatters on the bath tub, turned pale and rapidly withdrew. It felt so good to be able to have a hot shower. I’m now sitting here working on the major revamp of the website, drinking lots of Sprite. Why? Because I drink far more of it than I would water, and it tends to dehydrate anyway, so I am flushing quite nicely thanks. I’ll switch to water later in the day to rehydrate. Monday – Opted to not go to work today. Now I have a conundrum, which I remember from last time. The channel where my pee comes out is the same one where the catheter has been rubbing it for the last 2 days, and it’s inflamed, which then reduces the size of said channel, but I need to flush the surgery site by drinking lots of liquid and peeing it out, but it hurts when I do! 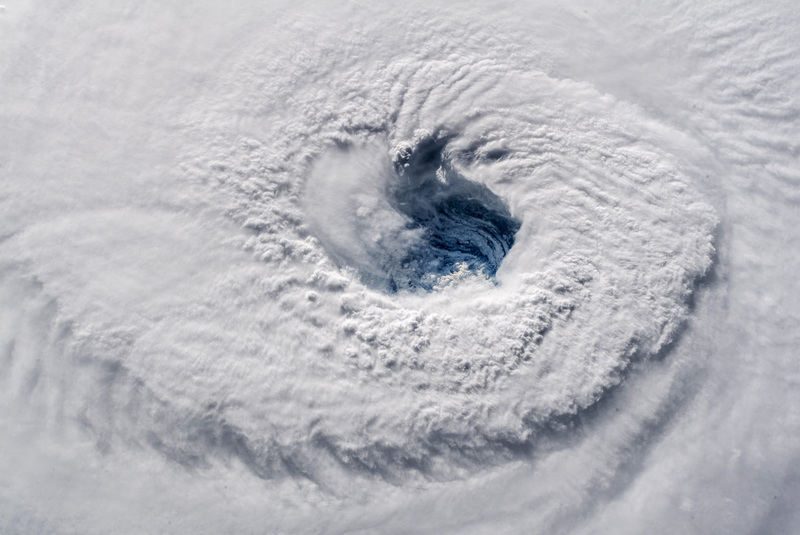 Meanwhile, with Hurricane Florence bearing down on the East Coast of the US, I came across this awesome picture of the eye. Quote: Early on September 12, astronaut Alex Gerst shot this photograph (above) of Florence’s eye as viewed from the International Space Station. He tweeted: “Ever stared down the gaping eye of a category 4 hurricane? It’s chilling, even from space.” The original is here. The following weekend, Simon was here from the Netherlands to accept an award from the direct selling companies associated with, or owned by, eBay, for his efforts in engaging all of them. He and I went for a ride on the Bainbridge Island ferry. Of course, the mandatory picture of a cruise ship at Pier 66. I’m amazed that the thing floats without tipping over. Must be a huge amount of ballast under the waterline. We enjoyed a rather large ice-cream each over there, before heading back. Some considerable time ago, I tried to capture the process of the ferry shutting down the forward thrusting motion, then opening the thrusting at the other end to pull away from the dock. Now, with much improved video editing software, I managed to produce this video in 3 stages, with a fade to black between them. 1 – the ferry is still pushing forward. 2 – It has stopped and the water appears calm, because it is still churning. 3 – It has started pushing at the other end and we are moving through the calm into the choppy. Julie joined us for dinner at Red Lobster to indulge in their new “All you can eat shrimp” deal. On Sunday, we went on the Boeing Factory Tour, something I had not yet done. No cameras of any kind are allowed on the tour, so no pictures. However, when we got back to the Museum of Flight, it was a different story. I was rather awed by the huge aerial picture of the whole area on the floor. I managed to grab this one from upstairs just as people moved off of it. Mukilteo on the top right with a ferry coming in. The Dream Lifter is used to bring in parts for the DreamLiner. Next stop was the Museum of Flight, also something I had not yet seen. We only had 2 hours to spare, but we did manage to cover most of the displays, albeit briefly. What the Milky Way looks like from the other side, apparently. One of the honkin’ big engines on the DreamLiner. Then it was a short drive to drop him back at the airport for a direct flight home to Amsterdam. For several months, Julie has been visited by the occasional hummingbird on the balcony, looking for food. Today, there were 3 of them and I managed to catch them in action. More action on the balcony, this time a bluebird. Not a sight you see very often – the SeaGals practicing. This is the “prison” game. Either I am VERY fast or I need to wear HEAVY gloves. Because I am still not completely healed from the surgery, I have had to come up with creative ways of heavy lifting. Most times, I can lift or lower equipment with a board across the forks of the pallet stacker, and push or pull from there. However, getting a set of equipment out of a job box is a straight lift. This is my solution. The strap around the fork has one hook into the handle of the pump and another into a loop of hose between the jack and nose piece. Unfortunately, this was the best picture I could get, because the phone kept getting dazzled by the glare off the shiny surfaces. Using the hose like this is purely a temporary solution, for me at least, although people on job sites do it all the time, and they get growled at if I catch them! Meanwhile, at home, the guard cat is looking after my work backpack. One of the advantages of being at the stadium early is that we get to watch the preparations for the opening ceremony. We managed to catch a rainbow last night. Of course, photos don’t do it justice, and the first one had to manually edited, but as we watched the rainbow got brighter and brighter.